Prices of paintings and sculptures have reached astronomical heights and art lovers are now looking for affordable options. Etchings, serigraphs and lithographs are emerging as an alternative to traditional forms of art. Limited edition prints are fast gaining in popularity among all classes of investors and collectors. Prints by modern artists such as Raza and Husain are already in the higher bracket and may even be out of reach for many buyers. Usually in terms of pricing prints cost a fraction of the cost of a painting by the same artist. In fact, one now hears of collectors who like to invest only in prints and are actively on the lookout for upcoming artists who are proficient in printmaking. There are a few artists who specialise in printmaking and their works are extremely sought after. 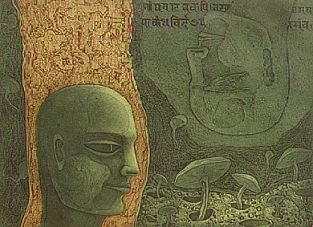 Artists such as Krishna Reddy (one of the finest printmakers in the country), Laxma Goud, Zarina Hashmi and Atin Basak are a few names that are known for their fine quality prints. The initial resistance to prints was mainly due to the fact that printmaking involves multiple copies. However, gradually the perception has changed and people are realising that this too is an original art form. The change has occurred over the years as the awareness about printmaking techniques has permeated the buyer’s consciousness. An edition size could be as low as five or as high as fifteen, but ideally a lower edition size is preferred. When buying a print, one should ensure it is a print and not a poster. In case of an intaglio, look for the plate mark which is an indentation along the edges which appears due to the pressure with which the paper is pressed upon in transferring the design. Limited edition prints are signed and numbered (S/N) by the artist. The lower the number of prints the better its investment value, however the higher the number of prints the more affordable it is.